Hyundai Australia has taken the roof of the popular selling Santa Fe SUV for a promotional campaign. The one-off Hyundai cabriolet will not go on sale, however, car journalists have been able to take it for a spin and get some great pictures of the one of a kind machine. The normal Santa Fe itself is one of Hyundai’s best selling SUVs as it combines practicality, luxury, style, reliability and most importantly, value for money. This 7 seater SUV cabriolet has turned the heads of many online and is said to be crushed and destroyed following the promotional campaign. 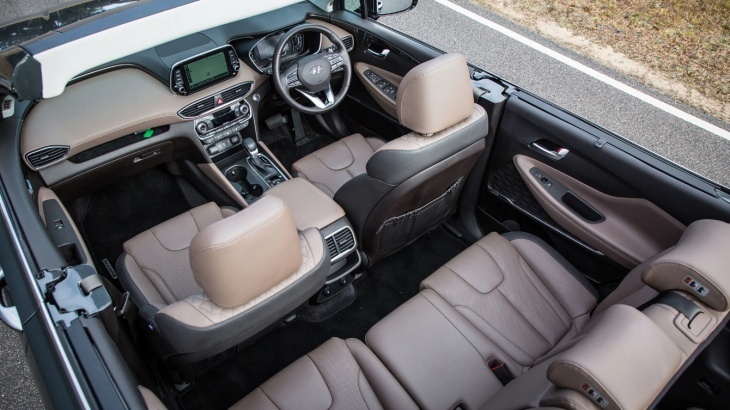 This particular version has the exact same specification as the normal Santa Fe, that includes high-end infotainment system, heated seats and steering wheel as well as a head-up display, the one major difference is the lack of a roof. Here are a collection of promotional images of this incredible car and it can carry up to 7 people in style.